The biggest and most populous of all the Greek Islands, Crete is a highly popular tourist destination and is seen as one of the main cultural and historical centers of Greece, as well as having its own unique idiosyncrasies to separate it from other parts of the country. Several million visitors are drawn to Crete each year and the island is well-known for appealing to a broad range of tourists, having activities and ideas to please people of all ages and backgrounds. Whether you're looking to kick back and relax on the beaches and by the pools or enjoy a more active break exploring Crete's museums and archaeological sites, you'll find a lot to love on this island. The weather on Crete is also another big bonus, with hot temperatures in the summer and warm to mild temperatures for the rest of the year, and these conditions are just right for spending time down on the beach, working on your tan or splashing around in the sea. Crete’s beaches have a lot to offer and vary quite a lot, from tourist-laden stretches of soft sand with lots of resorts and restaurants right nearby to more secluded, intimate spots to watch the sun go down with a loved one by your side. As one of the largest islands in the Mediterranean Sea, Crete has a very long coastline with a lot of beautiful beaches to be enjoyed. A big reason many people choose to visit Crete is to check out the island's beaches and spend some time on the sand, soaking up the sun and dipping their feet in the warm waters of the Mediterranean. For more information on the best beaches in Crete, read the guide below. You'll find lots of information about all the amenities, activities, and features of each beach to help you plan your next Greek vacation. A very famous and unbelievably beautiful spot, Balos Lagoon is one of those beaches that makes you simply have to stop and stare, taking in all of the incredible natural beauty in every direction. The views here are captivating and once you step foot on the soft sands of this Crete beach, you may never want to leave. It's one of the most photographed beaches on the island due to its unique beauty and is conveniently located only 10-15 minutes away from Kissamos. This particular beach has a pretty interesting history too, with Princess Diana and Prince Charles once stopping off to admire the scenery. Vai Beach is located on the northern shores of the island in the Lassithi area. It's a long beach formed in a gently curving shape which helps the waters here to be quite calm and gentle, ideal for young or inexperienced swimmers to splash and paddle without any danger. Vai Beach is one of the best family beaches on Crete and is surrounded on almost all sides by a truly enormous palm tree forest, giving it a real private island kind of vibe. 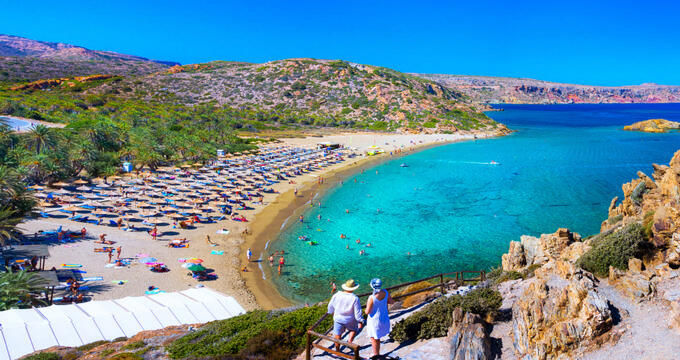 As with many of the other best Crete beaches, many visitors instantly fall in love with this location and want to come back again and again. A large sandy expanse is waiting to greet you at Falassarna Beach, situated on the western end of Cape Gramvousa. One of the unique features of this beach that really sets it apart from the others is the presence of some old Roman ruins at the northern end, so it's a super spot to visit if you have an adventurous sort of spirit and want to learn a little more about the island's history. The wide sandy spaces are also nicely suited to beach games and picnics, and the views here are phenomenal so you'll definitely want to bring a camera along and snap some vacation photos to share with family and friends when you finally head home. Elafonissi Beach is situated over on the southwestern shores of the island and is one of the longest and prettiest beaches in Crete. When you step out onto this beach, you could be forgiven for thinking you'd just arrived on a Caribbean island. The waters here are the perfect shade of turquoise and the sands are so soft and white, with just the faintest tinge of pink. A large section of this beach is also equipped with sun loungers and umbrellas, so it's a good idea to arrive early and grab a few loungers for you and your friends or family before the crowds start to gather later in the day. Activities to enjoy at this beach include swimming, sunbathing, and even snorkeling. Situated among an astonishing juniper forest, Kedrodasos Beach needs to be seen to be believed. This precious, pristine location is totally untouched by the tourism industry and is one of the very best beaches on the island. Sandy and rocky spots can be found all around this beach, which is located right by the stunning turquoise waters of Elafonissi Lagoon, and the nearby forests provide a picture perfect backdrop for photos, picnics, and romantic strolls with someone special.